I am always experimenting with lunch ideas. I am getting ready to start another year-long contract, so the lunches have to get portable again. I hate eating out at work. In all the years I’ve spent in corporate Calgary I think I ate out 1-2x a month. The rest of the time I brought my own healthful meals. After all these years, I have the quick go-to’s, the weekly mono-plan made on Sunday and the tried and trues. The trick is to keep the house stocked with fresh veggies and fruit, healthy grains, tuna, beans and the like. Don’t get me wrong there are days when it’s veggies and humus, a handful of rice crackers and an apple. But this to me is way better than having to forage at the company cafeteria or head to a restaurant. I have recently enjoyed a new wrap, adapted it from a recipe I have. The original is a bit bland, so I’ve changed it enough to call it my own and have some ideas on how to repeat this with other additives. Even though I warm this on my stove top Panini grill, you can make the filling, bring a pita, bread or rice crackers and eat it on the go. Drain and rinse the beans. In a bowl, mash the beans using a fork. Once you start mashing, add the oil, salt, pepper and lemon juice. The beans don’t have to be smooth, choose a consistency. Add the rest of the ingredients, mix well, taste and adjust. 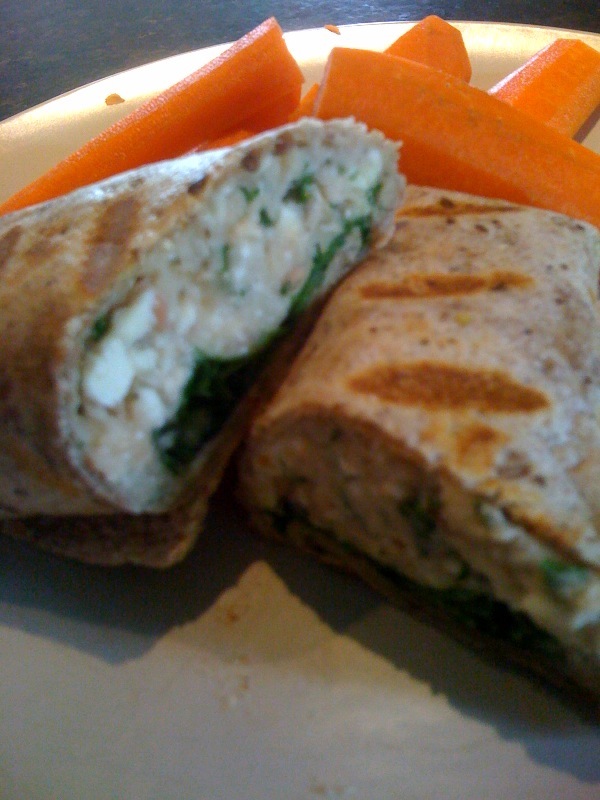 Spread on a whole wheat/grainy wrap, top with spinach, roll up, folding in the sides. Warm on a Panini or in a fry pan until grill marks/toasted. The sandwich isn’t hot, just warm to your liking. Serve with a salad or a stack of carrot sticks (remember this is supposed to be easy for lunch). Sounds good but I did enjoy our occasional Thai lunches out 🙂 Congrats on the new contract! Shaw again?